How To Fix "Register Globals Is Enabled" Issue While Installing Drupal? How To Fix “Register Globals Is Enabled” Issue While Installing Drupal? Drupal is a near to perfect CMS for any kind of website. It is easy to use and installs like a charm. However you may face a slight glitch when you try to install it online on a web host. Some web hosts have a PHP property called register_globals enabled by default. But Drupal requires this property to be disabled, else you may get an error while installing Drupal. In this article we will tell you how to fix this issue. Here is a screenshot of the actual error which you may face. Fixing this error is very simple. All you need to do is edit a few settings in your PHP configuration file - php.ini. However it is always recommended not to directly edit any base configuration files. Instead what you can do is, create an empty file and save it as php.in in your Drupal's root folder, that is the folder where you have installed Drupal. You can resume your drupal installation again by reloading the page where you got the error. 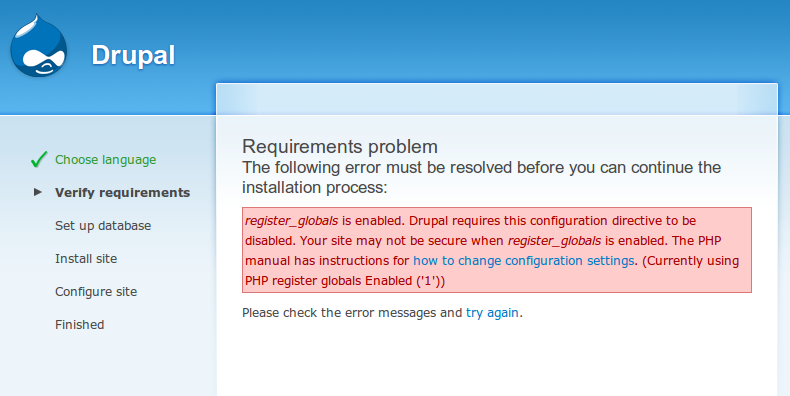 You can now see that Drupal will not complain any more about the register_globals error.